"Ferry ... Kalama, Washington, to Goble, Oregon"
Both a train ferry and a passenger ferry existed between Goble, Oregon, and Kalama, Washington. 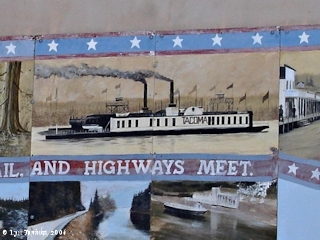 The train ferry began in 1884 and continued until 1908. The passenger ferry existed between 1908 (presumably) and 1934. 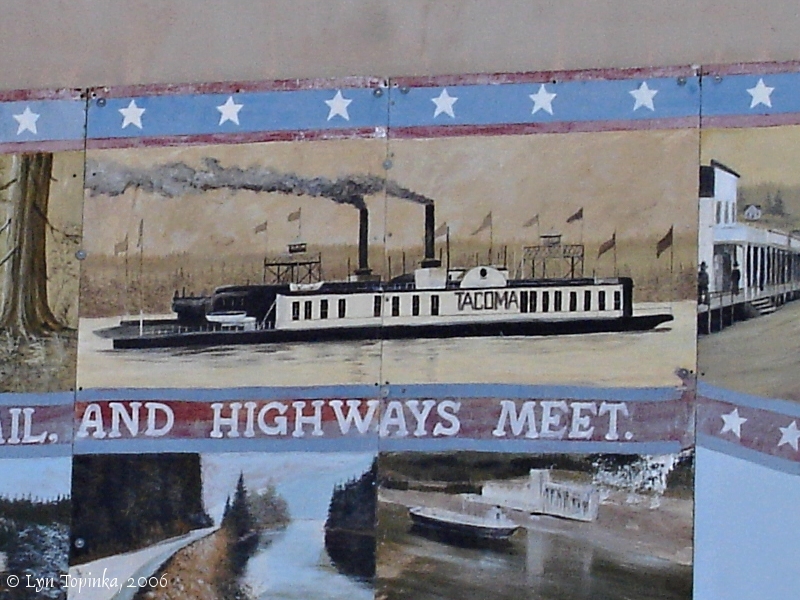 Between 1874 and 1884, travelers from Portland, Oregon, wishing to get to the Puget Sound region, had to first travel by ferry to reach Kalama, Washington, the southern ending of the Pacific Northern Railroad. "By boat from Portland down the Wallamet River into the Columbia, down the Columbia to Kalama, and from Kalama to New Tacoma by rail, is the ordinary dry-weather route from Portland to Puget Sound. Kalama, however, has a habit of ducking under, in the high times of the Columbia River; and at these seasons travelers must push on, northward, till they come to some spot where the railroad track is above water. On this occasion we had to sail well up the Cowlitz River before we reached a place where steam engines could go dry-shod and safe. Thence ninety miles to Tacoma, -- ninety miles of half-cleared wilderness; sixteen embryo towns on the way, many of them bearing musical old Indian names: Olequa, Napavine, Newaukum, Chehalis, Seata, Temino." Source: H.H., 1882, "Puget Sound", IN: The Atlantic Monthly, vol.51, issue 304, February 1882, p. 219-221 (online at Cornell University Library's "Making of America"). Between 1884 and 1908 travel between Seattle and Tacoma, Washington, to Portland, Oregon, depended on a ferry transporting the trains, passenger cars and all, across the Columbia River. The northern tracks headed south from Puget Sound to Kalama, Washington and the southern tracks headed north from Portland to Hunter's Landing, Oregon, and then in 1890, the tracks were completed to Goble. "After the ferry [Tacoma] was launched, transcontinental trains could continue southward from Tacoma to Kalama, Washington, there to be transported by ferry to Hunter's Landing, thence on to Portland. To handle the trains, engineers designed a ferry slip that rose and fell with the river's level so that trains could be loaded and unloaded expeditiously regardless of its level. The Oregon slip was moved to Goble in 1890. Tacoma could ferry up to 21 box or passenger cars as well as a "road" and a switch engine. Regular service between Kalama and Goble continued from 1890 to 1908, when the Northern Pacific's railroad bridge across the Columbia River connected Vancouver, Washington and points north with Portland." 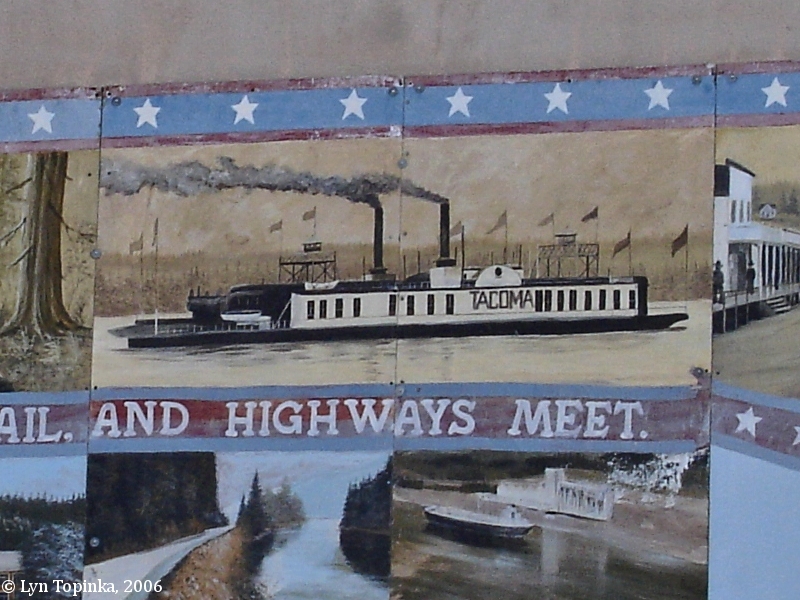 Source: Clarence E. Mershon's "The Columbia River Highway", 2006. According to the Cowlitz County Historical Society (information obtained from the Washington Secretary of State website, 2007): In the 1870s the town of Kalama was built by the Northern Pacific Railroad during the construction of rail line from Portland to Tacoma and Puget Sound. The railway ended at Kalama. Between 1874 and 1884, passengers and freight would transfer to steamers on the Columbia to continue their journey to Portland. Meanwhile, the Oregon Railway and Navigation Company had built a railroad on the Oregon side of the Columbia River to Goble, Oregon. To transport the trains across the Columbia, the Company bought what was at the time the second largest ferry in the world. The ferry The Tacoma was disassembled into 57,159 pieces and shipped around Cape Horn, and then reassembled in Portland. It was used to transport trains - engines, cars, and all - across the Columbia between Kalama and Goble. This service began in 1884 and ended in 1908 when a railroad bridge was built upstream on the Columbia connecting Portland, Oregon, and Vancouver, Washington. "The largest steamer set afloat in the Northwest in 1883 was the big railroad ferry-boat built to transfer Northern Pacific trains across the river at Kalama, Wash. The steamer was brought out from New York by the American ship Tillie E. Starbuck, her manifest showing the ferry-boat to consist of 57,159 separate pieces. She was put together at Portland and launched May 17th by Smith Brothers & Watson, and was handled on her trial trip by Capt. E.W. Spenser. She was first christened the Kalama but is now known as the Tacoma. Capt. George Gore was placed in command of the steamer, with Charles Gore, chief engineer, and that they are both still holding those positions is a high compliment to their ability as steamboatmen. Other members of the crew for several years past and present time are William Simpson and A.F. Hedges, pilots; John Larsen and Thomas Poppington, mates; William Lewis, Elias Vickers, Joseph Collyer and Michael O'Neill, engineers. The Tacoma's dimensions are: length, three hundred and thirty-eight feet; beam, forty-two feet; depth, eleven feet seven inches; engines, thirty-six by one hundred and eight inches." Source: Lewis & Dryden's Marine History of the Pacific Northwest, edited by E.W. Wright, published by The Lewis & Dryden Printing Company, 1895, p.320. "The Northern Pacific contracted the construction of a mammoth steam-powered ferry. 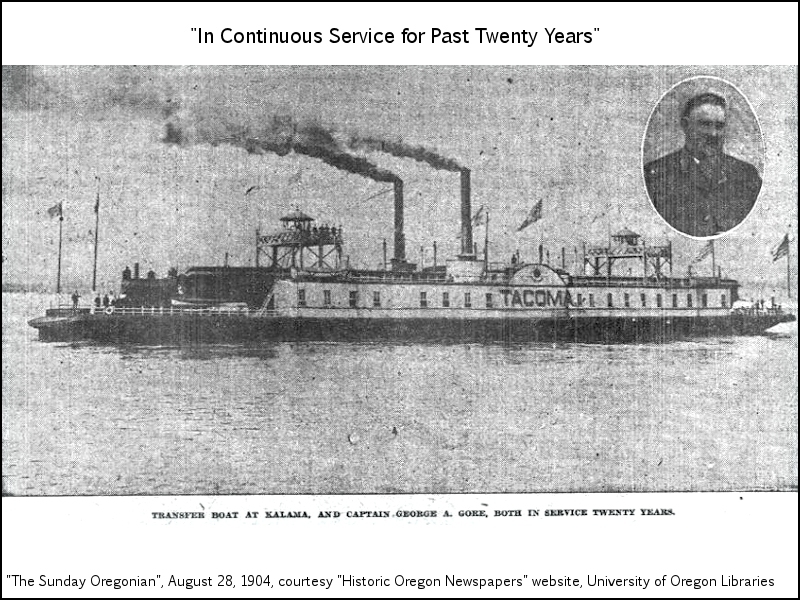 Originally named the Kalama, she was renamed Tacoma before being placed into service. The ferry was 340 feet in length and 76 feet wide and was capable of carrying an engine and 23 freight cars, an entire train, on its deck. The ferry was powered by two large steam engines that turned paddle wheels 29 feet in diameter. The pistons in the steam engines were three feet in diameter and had a stroke of eight feet. The Tacoma ferry was able to carry a complete train across the Columbia River to Goble, Oregon, in about 20 minutes. Constructed in New Jersey, the Tacoma was disassembeled into 57,000 pieces, sailed on a ship around the tip of South America, and reassembeled in Portland. The Tacoma was captained by G.A. Gore for most of her 25 years of service. Eventually, the rail line was completed to Vancouver and a bridge was constructed between Vancouver and Portland, and the need for the Tacoma ended in 1908." Source: The Kalama Community Action Plan, prepared in 2004, description of the Kalama-Goble ferry. How did the Ferry Work ? "Emerging from thriving, driving Portland, at fifteen minutes before midday, the train speeds nearly northward down the western bank of the Willamette, twelve miles, with the fair stream in full view on one side, and precipitous fir-crowned bluffs on the other. Then turning westward, the iron horse plows along the southern brink of the Columbia until opposite Kalama, in Washington. Here, close by the river, the creature stops, un-couples from the coaches, backs a few rods, glides off on a side track, and -- looks on. In an instant, another engine near, homely of aspect, gigantic in strength, slowly approaches the train, from behind, locks into the rear car, and gently pushes the whole down the bank and on board a huge transfer steamer, pouring columns of dense black smoke from its tall pipes, at the end of the track. On the broad deck of the steamer three railways are laid. The coaches glide upon the middle one. Immediately the great locomotive disengages itself, retreats a few feet, switches on to the left track, comes aboard, and halts beside the train. Meantime engine number one has left the side-track and may be seen creeping down the incline. Taking the right-hand rails, it, too, comes aboard, flanks the passengers on that side, and stops breathing. Now slowly the immense boat pushes out from shore, moves up, and partly across, the broad river; then, reversing its engine, it drops down to the landing on the Washington side, and adjusts its three tracks to those of the staunch, sloping dock built down the side of the bank. Instantly the engine on our right wakes up, rolls off the steamer, up the steep grade, and gets out of the way on the main road. This done, the Black Sampson starts its wheels, moves out upon the dock, switches to the middle track, backs on board again, lays hold of the coaches, and pulls passengers and all up the bank, with an air which plainly says: 'That's nothing for an engine to do.' Leaving us on the main track, locomotive number one again proffers it services, and away we speed toward the north." Excerpt from: Emma H. Adams, 1888, To and Fro, Up and Down, in Southern California, Oregon, and Washington Territory, with Sketches in Arizona, New Mexico, and British Columbia: Cranston & Stowe Publishers, Cincinnati, Chicago, and St. Louis, p.390-392. The steamer Tacoma was built in New York in sections and brought around the Horn on the ship Tillie E. Starbuck, her manifest showing 67,159 separate pieces. She was put together at Portland and launched May 17, 1884. Her dimensions are: Length, 338 feet; depth, 11 feet 7 inches; beam, 42 feet. On her deck are three tracks the full length of the boat, making 1017 feet of track, capable of holding a passenger train of ten coaches and two engines, or a freight train of 21 cars. The distance traveled by the transfer each round tirp is at present four miles. Counting 12 round trips a day would give 48 miles a day, or 17,520 miles a year, and for 20 years would amount to 250,400 miles, or 14 times the distance around the globe. The boat has received extensive repairs this year. New boilers were put in and nearly all the wood used in her construction replaced with steel, so that by the time the repairs are coplete but little will be left of the old boat except her steel hull and her engines." Source: The Sunday Oregonian, Portland, Oregon, August 28, 1904. 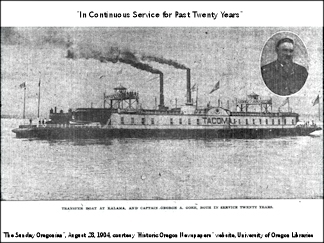 Click image to enlarge Newspaper Image: "Transfer Boat at Kalama, and Captain George A. Gore, Both in Service Twenty Years. ", The Sunday Oregonian, August 28, 1904. Train ferry between Kalama, Washington, and Goble, Oregon. Image courtesy "Historic Oregon Newspapers" website, 2013, University of Oregon Libraries. A passenger ferry existed between Kalama and Goble during the first half of the 1900s, to allow railroad passengers from Tacoma and Seattle heading to Astoria to avoid having to travel into Portland and then back up the Oregon side of the Columbia. "... The Goble-Kalama ferries, by the way, operate 24 hours a day on 15-minute schedule, so that there is virtually no delay in making the crossing." "... Martin Horan started a ferry service and Jack Reid converted a couple of fishing boats to carry passengers between Goble and Kalama so the Astoria to Puget Sound passengers could avoid the "loop" through Portland. Reid soon put a 100-passenger ferry, Queen, into service and, in 1923, after the highway was completed, put Elf which carried automobiles and freight, into service. Ferry service terminated in 1934 after completion of the Rainier-Longview bridge ended the need for the Goble-Kalama "transfer" business. ..."
"... Kalama, on the eastern bank, is an occasional stop for ocean-going vessels to pick up lumber. There is a ferry between Kalama, and Goble on the western bank. ..."